Did you have a good Thanksgiving celebration yesterday? We had dinner with my dad and his wife. Have to admit it is painful with my mom not there. She passed 4 years ago. And Christmas is still very tough. But I'm thankful for my memories of mom and how she enjoyed the holidays. Yesterday I finished a card as I gear up for Christmas. It's very simple. I've done many in this style and I still love doing them. I basically used a die to cut out the outline with part of it off the paper. 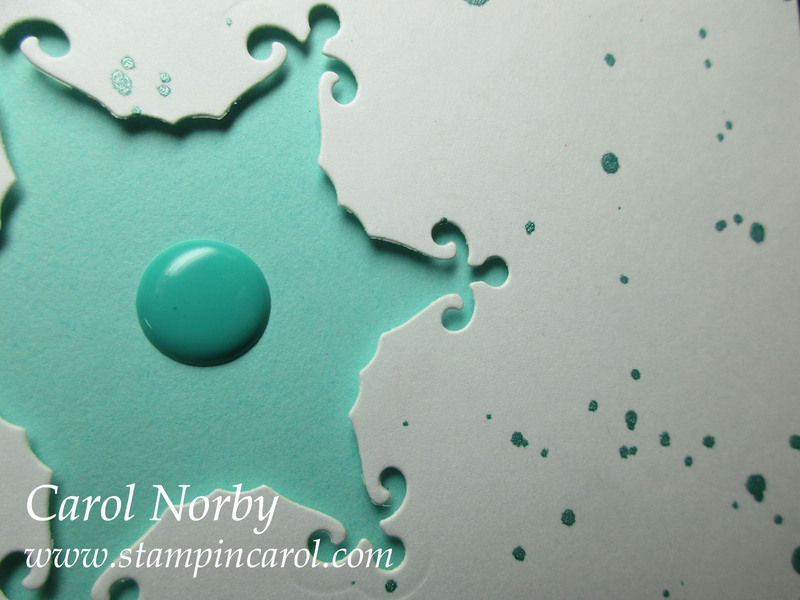 I splattered the top layer after stamping with Cool Pool Silk and added the fun Sweet Candy Drop to the center of the negative space. I only used 2 card stocks, Whip Cream and Cool Pool. The sentiment is from the Sparkle Trim stamp set and I used Black Licorice ink. And the die I used was Frosty Snowflake. I will come up with an idea to use the die cut on another card later. I also used my Easy Glide Runner, Foam Squares med., and my Platinum machine. This card only took a few minutes to whip out and is great for mass producing! Do you have a favorite to make?